Meet the five environmental human rights defenders who are travelling from Latin America and the US to the UK for Beyond BHP: breaking free from the world’s biggest mining giant. From 13-20 October we will be mobilizing around the multinational’s annual general meeting. Join us for a week of art, discussion and protest as the defenders demand justice for the trail of environmental destruction and human rights violations BHP has left in the Americas, and beyond. The defenders are from four of the thirteen countries that BHP operates in. They are travelling to London seeking accountability from the world’s largest mining company, from the devastation left in the wake of the Samarco dam disaster in Brazil, to the forced displacement of communities surrounding the Cerrejón coal mine in Colombia and the proposed Rio Tinto/BHP mining project, the Resolution Copper Mine in Arizona, USA. We’re working with The Gaia Foundation, War on Want, Colombia Solidarity Campaign, Three Penny Festival Collective and Coal Action Network. Please help us cover the costs of Beyond BHP. 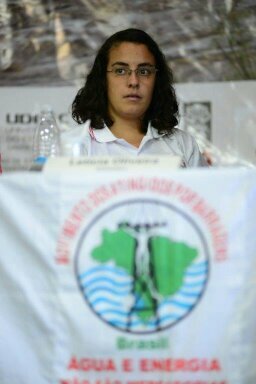 Leticia Oliveira is part of the national coordination committee of the Movement of the Affected by Dams (MAB). Before the dam collapse of 2015, she was already working for the movement and organizing activities in defence of the population in Mariana, a city near the Rio Doce. In the aftermath of the collapse, she has been developing actions and the resistance of the affected communities. The Movement of the Affected by Dams (MAB) is a national movement in Brazil in defence of human rights, water and energy. It struggles for the rights of affected communities along the basin of the Rio Doce, which was severely contaminated and radically transformed following what the movement describes as the crime of Samarco: the catastrophic collapse of the Fundao tailings dam. The rupture and ensuing disaster killed 19 people and contaminated 600km of the Rio Doce, affecting over a million people’s livelihoods, homes and communities. MAB organises those who’ve been affected, providing critical training about their rights and how to achieve them. It operates in several districts of the Rio Doce Basin. 1. Recognition of all those affected and of the diverse types of damages they suffered, especially the damage to income, which for many has not yet been recognised. 2. Recognition of women as an affected group. The data shows that the number of women recognised by the Renova Foundation is inadequately small. 3. Fair compensation for all those affected. The matrix of damages must be built by the affected communities and their technical advisories; this must be respected by companies. The indemnities must be processed in a timely manner; it has been almost 3 years. 4. Urgent resettlement of affected communities in individual resettlements. 5. Housing reformation needed due to the structural problems created by and following the dam rupture. 6. Structural proposals for the restoration of livelihoods, local economies and regular income for the diverse types of affected communities and individuals. 7. Consolidation of the technical impact studies carried out throughout the Rio Doce basin. 8. A rigorous study of the levels of water contamination, including the effects on fish and on the people along the Rio Doce basin; it must be paid for by companies, but carried out by a trustworthy team made up primarily by affected communities. 9. Alternative water supply to cities and communities who rely on the Rio Doce for their water. 10. Adequate medical treatment for all of the people contaminated by heavy metals. 11. Alternative ways to remove the tailings from the Candonga dam, without having to build another tailings dam near communities as is currently the case. 3 anos de lama, 3 anos de luta! Águas para Vida! Não para Morte! Do Rio ao Mar, não vão nos calar! Separados pela lama, Unidos pela luta! 3 years of mud, 3 years of struggle! Water is for Life! Not for Death! From the river to Sea, we will not shut up! Separated by mud, United by the struggle! Misael Socarras Ipuana is from the indigenous Wayuu community. He lives in north Colombia, La Guajira, in the community of La Gran Parada. He is a human rights defender, indigenous communicator, director, cultural expert and community leader. Misael says: “I am 48 years old, married according to the traditions of my people to Moncia Lopez Pushaina. I have six children, for whom I struggle daily to give them a better future, free of contamination and mining. [We want] to be autonomous in our territories, free and able to enjoy Mother Nature without restrictions or fear. I have dedicated myself to defending the territory and water, which belong to us and not to the multinationals. Rosa María Mateus Parra, lawyer in defense of human rights, territory and the environment, is a member of the José Alvear Restrepo Lawyers Collective (CAJAR), an organization that works for the enforcement of rights of indigenous, peasant and Afro-descendant communities. CAJAR aims to guarantee their survival and ability to remain in their territories while being able to exercise their social and environmental rights and strengthening their autonomy. This work is carried out through litigation, organizational capacity-building and advocacy. Rosa says: “We accompany the communities of La Guajira, because our paths crossed in life, we came to know the communities of La Guajira, and when you know a people and a place, you can come to love them. Now we love them and when you love something you defend it, that’s why we accompany the communities in their struggles and we defend them. We are participating in the advocacy tour in order to make a call for greater visibility and solidarity with the communities affected by the Cerrejón coal mine, these communities have been made invisible in their claims against the corporate power of Cerrejón. 1. We ask that the issues that affect thousands of people affected by the company are listened to attentively. The company tries to obscure a reality of contamination, the uprooting of indigenous ancestral territories, and the destruction of its social and cultural fabric, of diseases especially in children and girls, of the destruction of water resources – all of this under a slogan of corporate social responsibility. 2. We publicly denounce the systematic and widespread violation of human and environmental rights of communities, a company that acts as the largest socio-economic power in the region and a State with limited capacity and little willingness to enforce internationally recognised standards in human and environmental rights. 3. Considering the serious situation that exists in the territories and the recognition of the “Unconstitutional State of Affairs”, both by the Colombian Constitutional Court and the Inter-American Commission of Human Rights, it is necessary to call for the analysis and recognition of the externalization of costs of the open-cast coal mining activity of the transnational company Carbones del Cerrejón. If the costs assumed by the Colombian State in health, environmental, judicial, social and cultural liabilities, and from the economies of autonomous communities, who are now dependent on the company, were taken into account then the price of coal would be exorbitant and unpayable. 4. The company has captured, diverted, exploited and polluted the course of more than 18 rivers, streams and bodies of water, including the three most important in the region. Given the conditions of la Guajira, semi-arid and desert-like, these actions threaten cultural survival and food production, which is also linked to the severe starvation of Wayuu children, but to date there is no recognition of these impacts, nor to climate change, which also deserves attention and proposals by the company, especially in the second country most threatened by climate change. 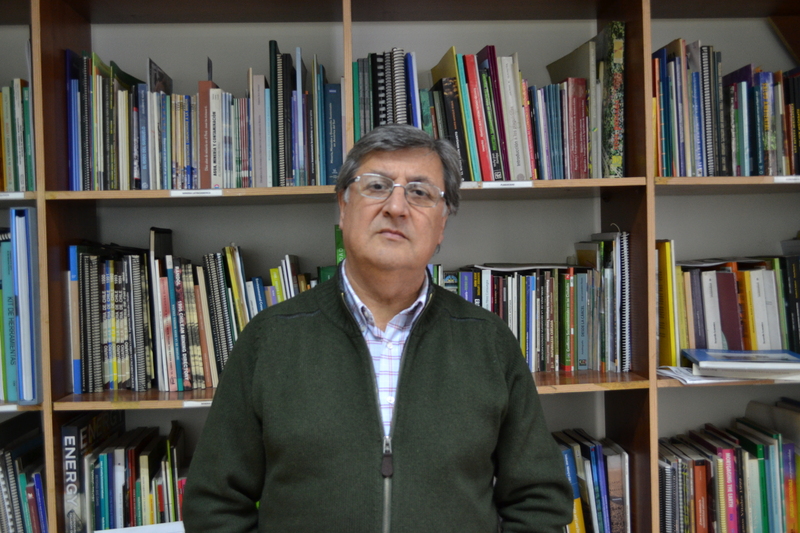 Lucio Cuenca Berger is a geo-survey engineer from the University of Santiago de Chile, Director of the Latin American Observatory of Environmental Conflicts OLCA, and member of the Board of Directors of the Observatory of Mining Conflicts in Latin America, OCMAL. Lucio primarily accompanies communities who find themselves immersed in social and environmental conflicts related to extractive industries in Chile, especially in mining, energy, forestry and urban pollution. BHP is the largest private transnational mining company that operates in the highest copper extracting country in the world. BHP’s three mining projects in Chile account for 5.9% of copper in the world, but the importance of these operations contrasts with the negative social, cultural and environmental consequences, which began in 1990 and continue today. The Salar de Atacama and Punta Negra (salt flat and high-Andean wetlands) are fragile sites in the middle of the driest desert in the world. Over-exploitation of water and pollution caused by Minera Escondida, BHP’s biggest mining project in Chile, has seriously destroyed these ecosystems, and has a negative impact on the livelihoods of indigenous communities Atacameñas and Licanantay, especially the Peine community, the nearest location to where the company draws water. BHP violates the human rights of indigenous communities and affects the right to determine their lifestyles, by destroying their lands and water sources. BHP does not respect the rights of workers because of its anti-union practices. BHP violates the right of community access to information but seeks to hide and not make transparent relevant data on the impact of eosystems and water. Lucio says: “BHP million dollar figures use money to handle public opinion, academia and the political system of our country. The company’s profits are so vast that allocating a small fraction of its profits manages to neutralize the criticism, evade state control, which sets only precautionary limits to the company’s mining projects, and ultimately avoids being punished for bad behavior and violation of rights. We demand that you stop pollution from affecting salt mines and water sources. You must repair the environmental damage caused in Salar de Atacama (salt flat), you must restore ecosystems exploited in Salar de Atacama, you must return the territories to community sovereignty as it was before the arrival of BHP. Latin American Observatory of Environmental Conflicts – OLCA accompanies communities in socio-environmental conflicts, who under conditions of deep asymmetry face a predatory economic model that imposes itself in their territories. The organisation promotes participation and collective leadership, the systematisation and exchange of experiences and knowledge, and the coordination and development of processes of identity assessment, from a gender and rights perspective. In this way, OCLA influences the construction of alternatives to development, which are at the service of life, ecosystems, and the communities and peoples that inhabit them. Roger Featherstone is Director of the Arizona Mining Reform Coalition. The Coalition works to reform national, state, and regional rules and regulations governing hard rock mining and supports coalition members to stop inappropriate mines in Arizona. Roger is also founder and producer for the GreenFire Project, an educational and inspirational organization that promotes wilderness values. Arizona Mining Reform Coalition works in Arizona to improve state and federal laws, rules, and regulations governing hard rock mining to protect communities and the environment. AMRC works to hold mining operations to the highest environmental and social standards to provide for the long term environmental, cultural, and economic health of Arizona. Members of the Coalition include Local, indigenous, grassroots and national organisations. Roger says: “My struggle to protect Oak Flat began 15 years ago. Resolution Copper planned to begin construction of their proposed mine in 2015. Due to our collective efforts, the earliest that could happen is a good five years from now. We’ll take our victories when and where we can! 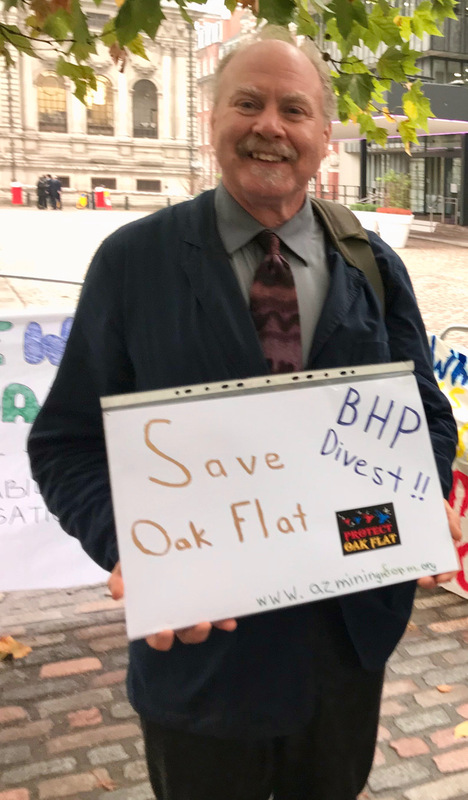 Rio Tinto and BHP have a lot of money and power to throw around and they’ve done so liberally in their quest to destroy Oak Flat. Yet at every turn, massive opposition has thwarted their plans. We defeated 12 versions of the land exchange and it finally took a dirty midnight deal to add the exchange to a defense bill to get it done. And, in the only public comment period so far, 120,000 people voiced strong opposition to the destruction of Oak Flat. This project is falling apart at the seams! Resolution Copper’s own studies show the preferred toxic tailings dump site is unsuitable and the US Forest Service is scrambling to locate a “better” location. Meanwhile, the company is laying off workers and our new report by Dr. Emerman shows clearly that Rio Tinto has put an unworkable mine proposal on the table. Follow #BeyondBHP on twitter for updates, come along to an event and please donate to our crowdfunder!